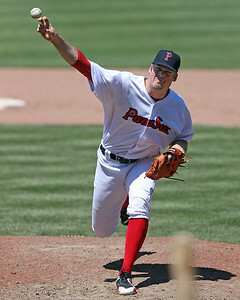 On Wednesday, 21-year-old right-hander Durbin Feltman received another promotion in his short stint in the system. The 2018 third-round draft pick was called up to Salem after impressing in seven games with Greenville and four with Lowell. The Boston Globe says "he is the first Sox draftee to move above Single-A Greenville in his draft summer in years," possibly dating back to Craig Hansen in 2005. Also receiving promotions were Jarren Duran (pictured, left) and Kole Cottam, who both moved from Lowell to Greenville. Duran, a seventh-round pick from this year's draft, is slashing .348/.393./.548 in 37 games. Cottam, a fourth-rounder from this year's draft, hasn't quite matched the production of Duran but has hit safely in six of his last nine games, with four of those performances featuring multiple hits. The rest of Wednesday's transactions involved Portland adding Jared Oliver from Salem and Adam Lind getting released from Pawtucket after he opted out of his minor league deal. The 34-year old didn't seem to have an opening with Boston anytime soon, barring any injuries. Red Sox president of operations Dave Dombrowski caught some flack for not acquiring another bullpen piece at the MLB non-waiver trade deadline on Tuesday, but he defended his actions on Wednesday as NESN.com's Ricky Doyle writes. Dombrowski dropped names such as Tyler Thornburg, Brandon Workman, and Ryan Brasier, to name a few, in which he expects to make contributions from the bullpen in the second half of the season while also saying "we have one of the top-ranked bullpens in the game." Salem third baseman Bobby Dalbec and Greenville right-hander Denyi Reyes were named the Players of the Month for July. Dalbec drilled 10 dingers to lead the Sox system for the month and has 25th homers overall, becoming the single-season home run leader for the Salem Red Sox. Reyes was a strike-throwing machine for the Drive. In five starts, he produced a whopping 30/0 strikeout-to-walk ratio. Photo Credit: Ty Buttrey and Jarren Duran by Kelly O'Connor.